It’s been too long since I wrote a post on the site. So you deserve a little update on the development of iCaching. We’ve been investigating a bug some users have when downloading pocketqueries through the API. we couldn’t reproduce the issue on the development machines, so it was like searching blindfolded. But the first reports on the fixed beta from users suffering from this issue are promising. 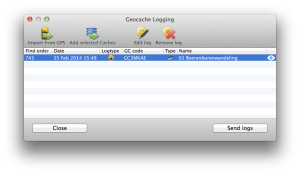 It will be possible to add selected caches to a log queue, or to download the geocache_visits.txt from paperless Garmin devices to load your fieldnotes from your GPSr to the log queue. In the queue you can edit one or more logs at the same time. The queue will show the find count and it will be possible to sort the queue by drag and drop. Does anyone know whether Magellan has a similar fieldnote file? The very first log written in the new log function. It is our mission to bring the best Geocaching experience to the Mac. iCaching is a native Mac app, with the look and feel you'd expect on your Mac. When something doesn’t work as you expected, please contact us. We’ll try to come back on you as soon as possible. And of course, when you like iCaching, please give it a good review in the App Store.